Organic semiconductor devices show a pronounced interplay between temperature-activated conductivity and self-heating which in particular causes inhomogeneities in the brightness of large-area OLEDs at high power. We consider a 3D thermistor model based on partial differential equations for the electrothermal behavior of organic devices and introduce an extension to multiple layers with nonlinear conductivity laws, which also take the diode-like behavior in recombination zones into account. We present a numerical simulation study for a red OLED using a finite-volume approximation of this model. The appearance of S-shaped current–voltage characteristics with regions of negative differential resistance in a measured device can be quantitatively reproduced. Furthermore, this simulation study reveals a propagation of spatial zones of negative differential resistance in the electron and hole transport layers toward the contact. 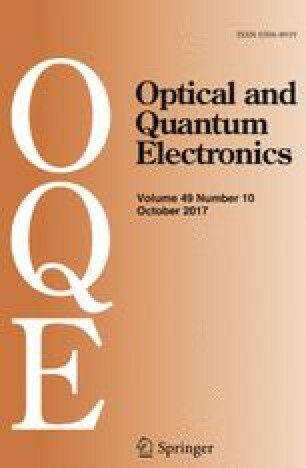 This article is part of the Topical Collection on Numerical Simulation of Optoelectronic Devices, NUSOD' 17. Guest edited by Matthias Auf der Maur, Weida Hu, Slawomir Sujecki, Yuh-Renn Wu, Niels Gregersen, Paolo Bardella. This work received funding via the Research Center matheon supported by ECMath in projects D-SE2 and D-SE18, the DFG CRC 787 "Semiconductor Nanophotonics", and it was supported in part by the DFG within the Cluster of Excellence Center for Advancing Electronics Dresden (cfaed) and the DFG project EFOD (RE 3198/6-1).